Taking Advantage of Labor Day Sales | Oh Sarah O ! Fall has been knocking on England's door since the middle of August. Last weekend I finally packed away my shorts and 'Spring/Summer clothes' and pulled out my Fall/Winter sweaters as cooler temperatures and endless cloudy/rainy days seem to be settling in. Even though most people doing capsule wardrobes don't switch their wardrobe over to Fall until October, I've already started carefully selecting my color palette and brainstorming what items I'm going to wear, what items I need to replace, and what items I need to pack away. Since there are so many sales going on, now seems like a great time to stock up on wardrobe basics. With all of that in mind, I've created my Labor Day Sale wish list. Old Navy: take an extra 20% off all items, plus free shipping over $50. Target: Buy one get one 50% off women's, men's, kid's, babies, and shoes. Up to 25% off home, sports, patio and furniture. 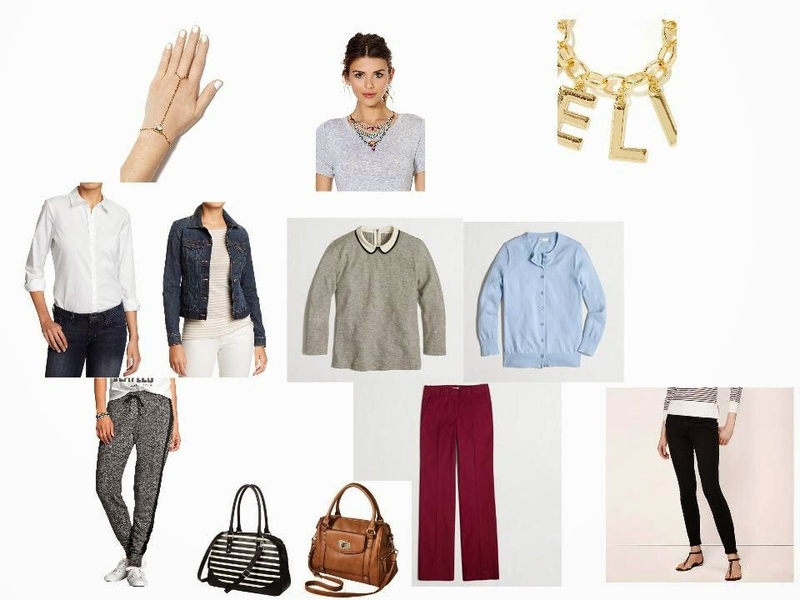 Hand piece (similar), Statement necklace (similar), charm bracelet, white button down (similar, similar), denim jacket, grey shirt, cardigan, track pants (similar), striped bag, brown bag, red pants, black jeans (similar). What's on your Labor Day Wish list?